Visual Studio Code>Snippets>Cordova ToolsNew to Visual Studio Code? Get it now. Code-hinting, debugging and integrated commands for Apache Cordova (PhoneGap). With added support for the Ionic framework. Debug your code, find commands in the Command Palette, and use IntelliSense to browse objects, functions, and parameters in plugin APIs. This extension works with any Cordova-based project. Open a Terminal (on a Mac) or a Command Prompt (on a Windows computer). Install HomeBrew on your Mac. Click the debug icon ( ) in the View bar, and then click the configure gear icon ( ) to choose the Cordova debug environment. The launch configuration file appears. It contains some default configurations such as what is shown below. You can modify these configurations or add new ones to the list. Just don't add a Windows or a Browser configuration as they are not supported yet. To start the debugger, choose a target from the target drop-down list, and then either click the start button ( ) or press F5. You can debug your app on an Android emulator or an Android/iOS device. If you have your app running in one already, you can attach the debugger to it. The debugger uses the application ID of your project to locate the running instance. Visual Studio Emulator for Android: To deploy your app to the Visual Studio Emulator for Android using our extension, you first need to manually launch the emulator. Once it is running, select the Run Android on Device debug target rather than the emulator target. If ADB didn't automatically recognize the VS Android emulator when you launched it, you will need to run adb connect [EMULATOR'S IP] on the command prompt before trying to deploy. To find out the IP address of your emulator, click the double arrow icon at the bottom of the emulator's side-menu to open the "Additional Tools" window, and go to the "Network" tab. Use the IP of an appropriate network adapter in the list. We won't go into all of the great things that you can do with the Visual Studio Code debugger, but you can read about it here. Troubleshooting tip: If you receive an error stating that ADB is not recognized as an internal or external command, you'll have to update your path variable to include the location of your ADB executable file. The ADB executable file is located in a subfolder along with your other Android SDK files. For example, on a Windows computer, the location of the ADB executable file would likely be here: C:\Program Files (x86)\Android\android-sdk\platform-tools. In the Command Palette, type Cordova and choose a command. 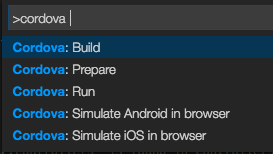 The Build command triggers cordova build and builds for all platforms that you've added to the project. Since all platforms are built you may receive errors for incompatible configurations. For example, if you're on a Windows computer, and you've added an iOS platform to your project, you'll get an error because you need a Mac to build for iOS platforms. You can't build an iOS app on a Mac by using VSCode on a Windows computer. The Prepare command triggers cordova prepare, which transforms config.xml metadata to platform-specific manifest files, copies icons & splashscreens, copies plugin files for specified platforms so that the project is ready to build with each native SDK. The Run command triggers cordova run and starts your app without debugging and just like the Build command, it runs all platforms that you've added to your project. The Simulate Android in browser and Simulate iOS in browser launch your application in the browser and they are described in the next section. The debugging target list includes two additional targets: Simulate Android in browser and Simulate iOS in browser. 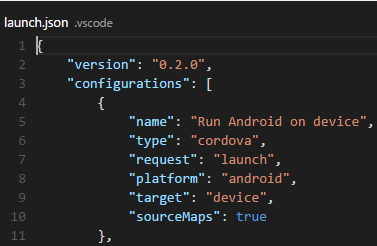 If you don't see these targets in your debugging target list, you might have to remove your .vscode/launch.json configuration file and regenerate it by following the steps described in the Choose the Cordova debug environment section. If you just want to run the application in the browser without debugging, two commands with the same names are available in the Command Palette. Note: If the simulate panel is closed accidentally when you navigate to a new file in your editor, it can be reopened by using Ctrl+Tab. This is the same command you use for navigating through your open documents. Here is a video demo of the feature. If you have feature requests or suggestions, please reach out to us here. The debug target includes the ability to serve to the browser for use with Ionic projects. You can now deploy and debug directly to Chrome, live reload is enabled by default. New Ionic commands have also been added to the Command Palette, type Ionic in the palette to see the full list. 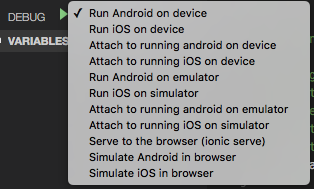 Ionic live reload is supported on devices and emulators. Additional IntelliSense has been added for Ionic, Angular and JQuery. Intellisense helps you discover objects, functions, and parameters in libraries that your project consumes. Now you can use it for the more popularly used core plugins. IntelliSense appears only for plugins that you've added to your project, but it doesn't matter whether you add the plugin before or after you install this extension. Just start typing in the code editor to see the objects, functions, and parameters of your plugin's API. By default, this extension supports the typings for the following plugins. To add typings for other plugins, place the appropriate .d.ts file(s) in your project's .vscode/typings folder. While IntelliSense is also available for Ionic and Angular, these frameworks use a dependency injection model for built-in services that VSCode's language service cannot understand by default. To properly enable IntelliSense in these scenarios, you will need to use JSDoc headers. 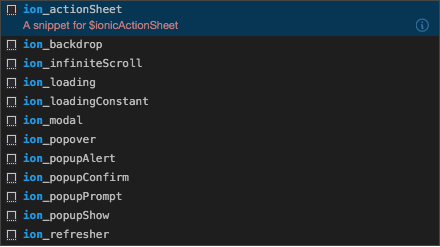 Our extension will provide the typings for you, so all you have to do is create the JSDoc headers above the functions you wish to receive IntelliSense for. Note: JSDoc headers may not be supported (for IntelliSense purposes) in old VSCode versions. 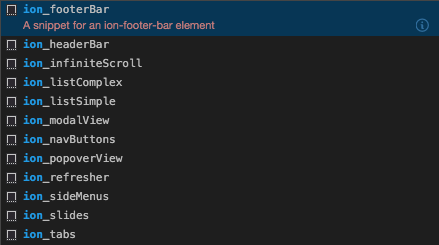 For a list of supported services for IntelliSense, see the angular.d.ts and ionic.d.ts typing files, which our extension places by default under .vscode/typings in your project. VS Code Cordova extension collects usage data and sends it to Microsoft to help improve our products and services. Read our privacy statement to learn more. If you don’t wish to send usage data to Microsoft, please follow the instructions below to disable its collection. Edit VSCodeTelemetrySettings.json file at %appdata%\vscode-cordova and add "optIn":false. Edit VSCodeTelemetrySettings.json file at ~/.vscode-cordova and add "optIn":false. Why can't I debug my app on iOS Simulator? Due to recent changes in macOS we cannot connect to simulators to enable debugging of Cordova apps. We hope to re-introduce this functionality as soon as macOS provides a mechanism that allows the extension to connect to apps running in simulator. You can read more about the issue here. It caused by ionic cli bug. As workaround, you can use Node JS v10+. After running Ionic 4 project on native platform I get white screen in application and error (intermediate value).fill is not a function in Debug Console. Explanation and solution for it. Add "ionicLiveReload": true to your attach debug configuration and reattach.